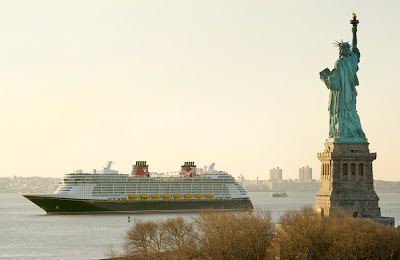 The Disney Cruise Line's newest ship, the Disney Fantasy, has made it's way from Germany to New York City in preparation for its official Maiden Cruise on March 31st. It is quite a site to see this spectacular ship with the Statue Of Liberty in the foreground. This won't be the last time that the Disney Cruise Line visits New York City, starting in May the Disney Magic arrives for a series of Cruises that will depart from New York City.